“Adversity makes men, prosperity makes monsters”, according to Victor Hugo. The US government shutdown should have negative ramifications for the stock market, and just may be the “harbinger” of the dreaded 5% to 10% correction. But don’t hold your breath! If the stock markets choose to ignore this serious event – then we know we are on borrowed time. The right thing to do would be for the markets to correct on this event and let all the hot air dissipate! Whether that actually happens is another thing all together. Such seems to be the nature of this very different incumbent bull market. What we should see today is for the stock markets to be sold down heavily, another lift in government bond yields (across the global spectrum), a broad based selloff in the US dollar, and a sure and steady increase in precious metal prices. Today’s reaction by markets will be very telling. In Australia the market rounded off the week on a soft note with the ASX200 closing 9 points lower at 6005. The index was down around 1.1% over the five trading sessions, despite some encouraging economic data and corporate releases. Monthly consumer confidence data came in at a four year high, while the healthy state of the economy was underlined by a still low unemployment read, and the fastest annual pace of job growth since the financial crisis. This must surely come through into meaningful wage growth at some point, which will help the plight of indebted households. As I noted last week, the production reports from the big diversified miners including BHP, Rio and South32, were all encouraging. Output has generally been maintained near record levels, with the outlook for further growth over the medium term. Placing this in context of high commodity prices (which have much further to go in our view), and falling costs, and the earnings/cash-flow pictures ought to see further broker upgrades coming through. There will be corrective phases, but (as outlined in our predictions), the resource sector should drive the ASX this year, and we remain overweight resources and energy in our portfolios. Japan-listed Sony shares gained 1.2% on what was a quiet day for Japanese stocks on Friday. There wasn’t any particularly big news flow moving the stock, but the company is in the best shape it has been in for many years. Sony has forecast a record profit in the fiscal year ending March 2018. The robust health of Sony’s results are a testament to the restructuring efforts of Kazuo Hirai. He has spun-out or sold several businesses such as the Vaio computer business and through triage has returned segments such as the Home Entertainment and Sound (TVs) to the black. A few years ago, the segment was bleeding red ink, but in the second quarter the TV business posted an operating profit of ¥18.9 billion. Meanwhile, the PlayStation and sensors businesses are thriving, with the former crossing the 70 million in unit sales by the end of 2017. Last Friday Chinese online search giant Baidu announced the hire of three senior AI (artificial intelligence) scientists to join Baidu Research, along with the establishment of two additional AI labs. Baidu is one of the leaders globally in the highly promising area of AI, which is attracting huge amounts of funding due to its massive commercial potential. Although much of AI’s monetization potential is in the future, Baidu is leveraging its expertise in the space to improve search and advertising placement to bolster revenues now. Longer-term the possibilities are vast, and with the key pieces of the AI puzzle in place in Baidu, the company is well placed to capture a significant slice of this opportunity going forward. Baidu’s new key hires are “three world-renowned artificial intelligence scientists,” being Dr Ken Church, Dr Hui Xiong and Dr Jun Huan. All will work out of Baidu’s Sunnyvale (California, USA) laboratory and the mix of different expertise reflects the multidisciplinary nature of AI research. After breaking free from a triangle trading range last year, Baidu (china largest search engine and AI Corporation) has rallied convincingly. 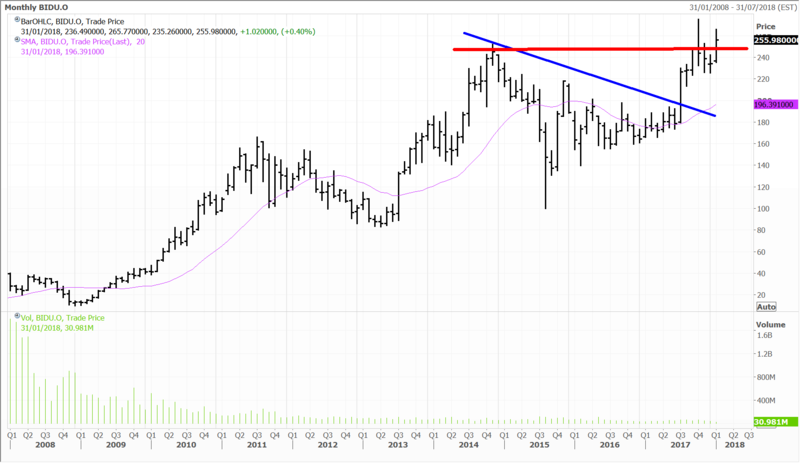 Baidu has now cleared resistance and is en-route to making new record highs. I believe Baidu will double within the next few years. Baidu is a top ten holding in the Fat Prophets Global Contrarian Fund and the Global Opportunities Managed account portfolio. Dr Church is a specialist in natural language processing and previously has worked at IBM’s Watson Research Center, John Hopkins University, AT&T Labs and at Microsoft. Dr Huan is an expert in big data and data mining, while Dr Xiong’s focus has been data and knowledge engineering. The latter two new hires come from professor positions at American universities. Baidu Research, the group the new senior hires will join, was established in 2014 to focus on cutting edge fundamental research in AI. It is now part of Baidu’s Artificial Intelligence Group (AIG), which now has more than 2,000 scientists and engineers under its umbrella. Most of Baidu’s multi-billion research and development (R&D) budget over the past three years has been directed towards AI. Baidu has opened research and development efforts in more than 90 core AI capabilities, including voice, image, video, augmented reality, NLP, knowledge graph and data intelligence, among others. Besides heavy investment, Baidu and more broadly speaking, Chinese companies are well placed for the AI race. A deep pool of data is perhaps AI’s most important input with so-called deep-learning algorithms using reams of data to “learn.” The more data that is available the “smarter” these algorithms generally become. China has around 750 million Chinese online citizens and these are tightly monitored compared to counties in the West. This provides a “structural advantage” of sorts in China’s AI efforts according to Baidu’s highly-regarded chief scientist Qi Lu, who formerly was instrumental in Microsoft’s AI charge. The data Baidu captures from its online search business is a major advantage for Baidu, just as it is for Google. Google, which is the core of Alphabet, has long been a holding in the Global Opportunities and US Managed Account portfolios and performed strongly. Data from searches are usually so broad-based, hitting on a vast number of topics and this provides enormous usefulness for machine learning efforts so fundamental to AI development. Baidu has been adding image and voice search functions to capture even more useful data about user habits and preferences. Last year the company claimed 97% accuracy in voice recognition and 99.7% in facial recognition. China’s vast population also provides a deep pool of research talent. Many of its diaspora have returned home from top notch universities and roles at major corporates around the globe over the past decade. In addition, many Chinese universities have shot up the rankings and students in the country are well-known for their expertise in hard sciences such as maths and physics, as well as in language translation. 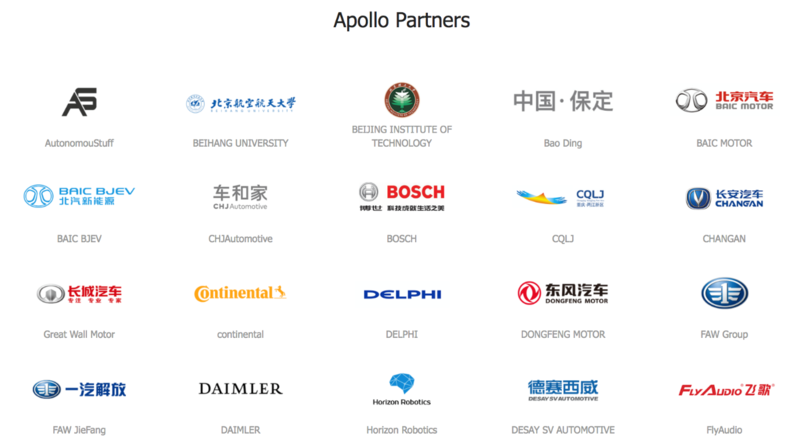 Baidu’s two new labs being established for Baidu Research are Business Intelligence Lab and the Robotics and Autonomous Driving Lab. The first will seek to commercialise AI and related technologies across a wide variety of industries, by solving problems and streamlining processes. Mr Li previously provided an example of how the company’s technology has cooperated with a seafood supermarket, reducing waste by 30% and improved profitability by 20%. He said the mining industry, which has accumulated reams of data, could significantly reduce accident rates by adopting AI. Baidu is helping plan smart cities with world-leading transportation in Xiongan, Baoding and the larger cities Shanghai, Beijing and Chongqing. Baidu is yet to report fourth quarter numbers, but the underlying third quarter was solid, with strong top line expansion. Baidu revenues in the third quarter came in at RMB 23.5 billion (US$3.5 billion), up 29% increase on a year ago. Operating profit hit RMB 4.7 billion (US$706 million), representing a surge of 69%. Net income of RMB 7.95 billion more than doubled (+157%) from a year earlier, boosted by RMB 4.23 billion of other income linked to the sale of Baidu Deliveries. Nasdaq-listed shares of Baidu have started the year well, gaining 9% and are up 45% over the past year. Baidu is a major holding in the Fat Prophets Global Contrarian Fund and in our Global Opportunities, US and Asian Managed Account Portfolios. The latest instalment in the Star Wars space opera, The Last Jedi is estimated to have pulled in about $1.3 billion at the box office globally as of 21 January 2018. Only released in mid-December, it quickly became the biggest movie at the box office for 2017. In early 2018 though its box office performance has been tarnished by a very weak showing in China, creating a drag on its international box office performance. This has many calling it a flop, although that seems sensationalist considering it is already a top-10 movie at the box office globally (unadjusted for inflation). Although the tally might seem a little light compared to the almost $2.1 billion, The Force Awakens, gathered at the box office, this was always going to be an unfair comparison. The Force Awakens marked the return to cinemas for Star Wars after a decade. Under Disney ownership Star Wars will continue to be a huge money-spinner and movies almost assured of grabbing a $1 billion at the box office each year would have most studios salivating. Meanwhile, if successful, the pending acquisition of a slew of Fox entertainment and sports assets could see Disney apply its winning formula to X-Men, Fantastic 4 and Deadpool, while Avatar has 4 sequels in the works. The first Avatar film still holds the global box office record. Fox’s film business also contains the Ice Age and Planet of the Apes franchises. On the television side, the acquisition will bring the likes of The Simpsons, Homeland, Modern Family, The Americans and Empire shows under the Disney roof. Fox’s global sports platform complements the US-centric ESPN business and should sooth some investor concerns about ESPN headwinds as it will become a much smaller part of the overall pie. The Star TV India business is fast-growing, with a long runway of growth in the Indian market. The acquisition of the Fox assets is a transformative deal for Disney and a successful completion would cement Disney’s position as the number one entertainment business worldwide. Disclosure: The Fat Prophets Global Contrarian Fund declares a holding in Sony, Baidu, BHP, South32, Disney.